A few months ago, circa September 2014, I took a two day trip through the Cumberland Gap (mind you, no bouquet of dogwood flowers were picked, but a lot of Old Crow Medicine Show music was played during the six and some odd hour car trip) to visit the Cumberland Falls Kentucky State Resort Park in order to "witness" the legendary Cumberland Falls Moonbow during the September Full Harvest Moon. Conversely, while the term Moonbow tends to make the mind create elaborate fairytale fantasies of rainbows appearing under misty moonlit pools (and unicorns may or may not be involved within such fantasies); however, the actual effect observed is far less spectacular (at least, relative to such fantasies), since the Moonbow visually resembles a flashlight beam through fog with a slight hint of rainbow colors occasionally appearing, at least to the human eye. 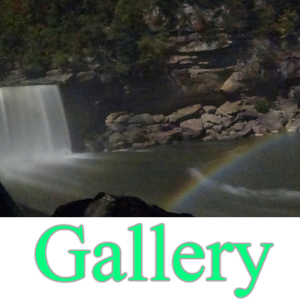 Now, while the pictures above do appear to be taken in daylight (thanks to the low ISO settings and tripod utilized); however, rest assured that these pictures were (in fact) taken in complete darkness and (as a word of caution) should you decide to see the Moonbow for yourself. I strongly recommend bringing a flashlight since the place is completely dark, full of unlevel ground, natural potholes, and has slick stairs that could easily trip an unprepared adventurer. Furthermore, (if you do decide to see the falls for yourself) I also recommend reading up on lowlight photography techniques (as knowledge about ISO settings and a tripod is needed at a minimum) since the number of people trying to capture the Moonbow using a iPhone, iPad, or Android phone and wondering why they only obtained a black image was rather high. Additionally, while the phone photographers were rather amusing to watch (and mostly benign in their photographic endeavors); however, the slew of people trying to photograph the Moonbow using flash photography were rather aggravating (and potentially harmful since their stochastic flashes potentially distort the low speed ISO capture and makes it harder for your eyes to adjust to the darkness). Nevertheless, while I must admit that my nighttime photography is currently mediocre (though I am trying to learn something new everyday), I was impressed that my older Sony Cybercam was capable of obtaining the pictures that it did (noting that these photos were the first time I actually utilized the low ISO settings) and I am rather pleased with the results obtained.